What if for your 11th birthday, you could call on a spirit animal to bond with you? 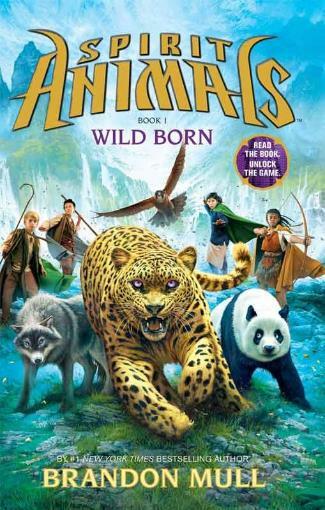 With it’s fantastic new multi-author series, Spirit Animals, Scholastic has created an exciting new world for young readers to adventure to. Wild Born by Brandon Mull, is the first story in this thrilling new series, that takes us on a journey to the fascinating and unique world of Erdas. Here, we can imagine what it would be like as a child to grow up in a world where you could call upon a spirit animal to bond with. It lets us make believe that we are about to participate in a coming of age ceremony. Not just any ordinary ceremony, but one that could call up a spirit animal, and if chosen, this rare bond will gift the child with special powers unique to the spirit animal they have bonded with. Sounds pretty amazing, right? Spirit Animals, coming of age, and magical powers. The story centers on four children named Conor, Abeke, Meilin, and Rollan, who are each from very different cultures, who have called upon their spirit animals. Each is asked to join forces with a mysterious and secretive group know as the Greencloaks, to fight against a terrible and vengeful enemy known as The Devourer. Now the children must call upon their legendary spirit animals, a wolf, leopard, panda and falcon, to assist them on their quest to find a legendary talisman before it falls into enemy hands. Children will be intrigued by Wild Born’s world Erdas, where its fate rests in the hands of four ordinary kids, two boys and two girls, to save their home world. Brandon Mull does a fantastic job creating distinctive young characters, and a world that looks and feels similar to our own, but one that is infused with magic. Exciting world, heroic characters and adventure! I loved, and I think young readers will too, meeting each of the characters and getting to know about them and their homeland customs. An added bonus is that we get to enjoy reading from both the boys and the girls perspectives, and our young female heroines are just as tough as the boys, one is a huntress and the other a (secretly) trained warrior! The author Brandon Mull did a great job with the initial set-up for the world building. He created the vast world of Erdas, filled it with magic, unique characters, and a great plot, all the while keeping a good pace and understandable for younger readers. Wild Born brings to life and the magical world of Erdas and the young heroes who live there. There’s plenty of action to read about, great place settings that feel adventurous, as well interesting heroes for both boys and girls to relate to. Wild Born is a great start to a brand new series for young readers, and I cannot wait to see what each new author has in store for the World of Erdas. There is also a online game tie-in to this series here for fans. PLEASE NOTE: A Copy of this book was provided by NetGalley/Publisher in exchange for my review. Thank you Scholastic for the review opportunity!